Help celebrate 130 years of the Junior Grange by donating for the Junior Grange Anniversary Fundraiser. Junior Grange provides an opportunity for children to build character and develop self confidence, responsibility, and respect. Write a story about the CURRENT Junior Grange Theme OR be as creative as you can by telling your own story. Using the theme for the appropriate year draw or paint a picture showing what the theme means to you. 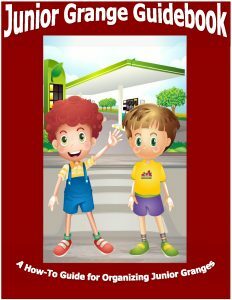 Welcome to the Junior Grange Website! Do you want your child to have opportunities for positive growth, to participate in community service, and to have fun with others their age while being supported by caring adults? The Grange recognizes that one of the greatest needs of young families today is a place the family can go together — where all children are welcome. That place is the Grange. While the parents take part in Grange meetings, the children can conduct their own meetings and take part in activities at the same time. Junior Grange provides an opportunity for children to develop self-confidence, leadership skills, while fostering the traits of accountability, responsibility and respect for self and other. The Junior Grange also encourages honor, patriotism, an understanding of agriculture and an opportunity to improve the communities where the children live and play. 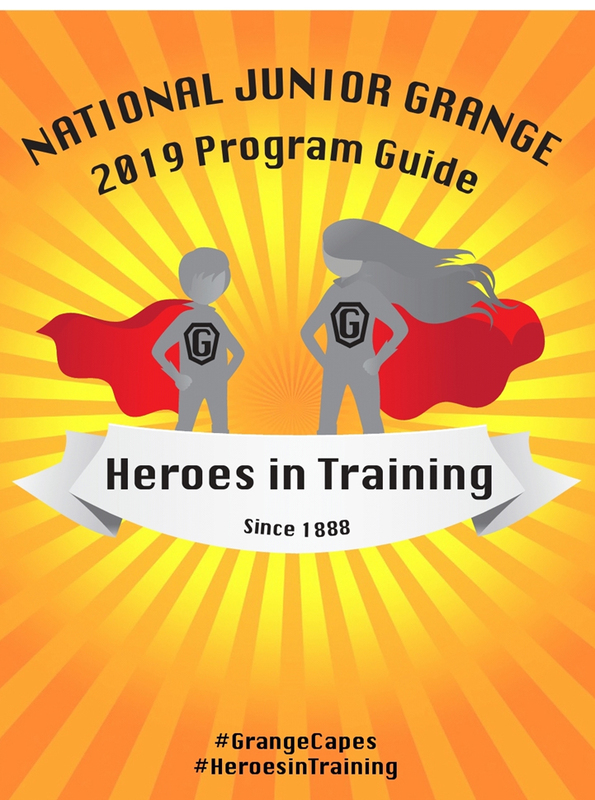 Junior Grange programs are designed to provide opportunities for young members to take on leadership roles as they learn about parliamentary procedure and public speaking. They learn to serve on committees and have fun at the same time. Junior Grange members also create and lead teams to complete community service activities. Now there are more opportunities for children to participate in the Junior Grange program. 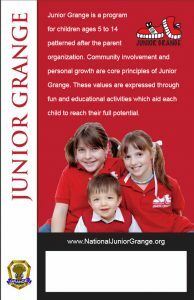 In Subordinate/Community Granges where there is no chartered Junior Grange, children between the ages of 5 to 14 may join as an individual Junior Grange member allowing them to participate in all of the regular Junior Grange programs. 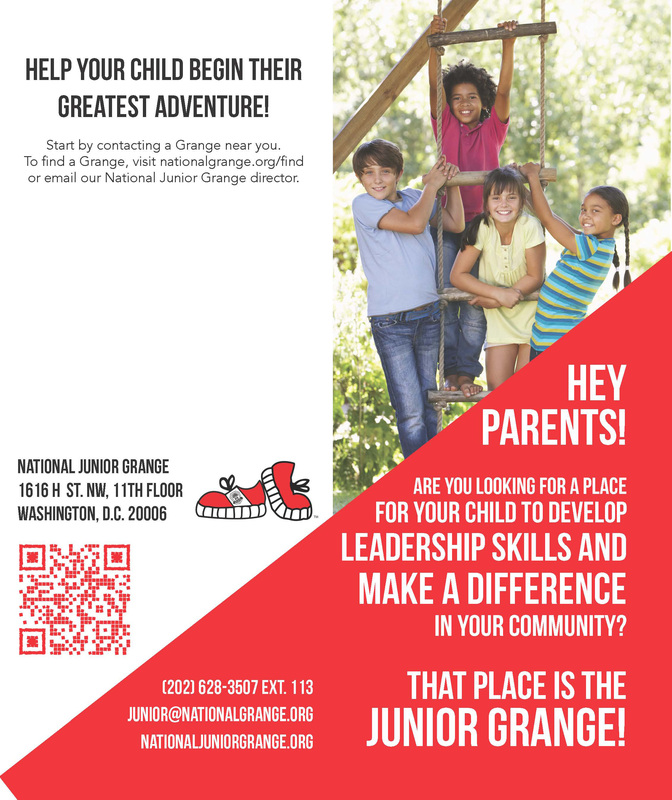 If you would like more information about the Junior Grange Program, please download our flyer.